Which Transformers Are the Cool Ones? Boys love Transformers. That's a fact of life. You have death, taxes, and boys loving Transformers. It's pretty simple, if you think about it. What are the two coolest things in the world? The answer is huge vehicles, and huge robots. If you get a huge vehicle that can transform into a huge robot, you get triple cool points. So the title might be a little misleading. Which Transformers are the cool ones? Well, all of them, really. The question is which are the coolest ones, and which are the ones you only need if you want the full set? This guy is basically The Man. 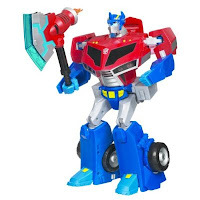 He's the primary hero of the series, in pretty much all of its incarnations from the animated series to the new movies to the old comic books, leader of the heroic Autobot Transformers. A big red semi truck that transforms into a superheroic robot. He displays courage, competence, and compassion, the ultimate hero. He should be the first Transformer on your shopping list if your kid is into robots. Leader of the evil Decepticon Transformers, Megatron is ruthless and extremely powerful, although he's not without a sense of honour, he and Optimus Prime have a grudging respect for one another as rivals, which makes him all the much cooler a villain. In the new movie, Megatron transforms into a stealth fighter jet. In the original toy line, he transformed into... a handgun. There's no telling who would be large enough to fire a gigantic handgun, or how Megatron thought that a giant handgun would be an inconspicuous disguise while he tries to blend in on planet Earth, but hey, it was the eighties. Starscream isn't clearly a badguy or a goodguy, and has sided with both the Autobots and the Decepticons at different times. He's considered a thrill seeker, and has literally the coolest name any robot has ever had. Depending on the version of the toy, he transforms into anything from a combat helicopter to a fighter jet. Bumblebee is the Autobot's "scout" in the new movie. He transforms into a yellow sports car and searches Earth to find the badguy's hiding place before calling the other Autobots. The cool, hip, competent Autobot. He has a thing for hip hop music, a sense of flair, and transforms into a silver sports car. A Decepticon with a thing for authority, he transforms into a police cruiser, featured as the baddie in one of the tensest, scariest moments in the new movie. We could list about a dozen others, but beyond the ones we've got above, it comes down to personal preference. Take a look at the description and see what the robot turns into, like it turns into a tank and your kid has always had a thing for military heroes, if it turns into a helicopter and your boy wants to be a pilot, you're set. You don't have to be an expert on all the dozens and dozens of different Transformers are available, just know what your kid is into and look at some toys online, there's probably a Transformer to match his interests. Yogee.com.au is a leading Australian online toy store. Visit yogee.com.au for a wide selection of Kids Toys at discounted prices. To save money on your next purchase, please visit Toys.